MASBIRT TTA held the 2nd Statewide SBIRT conference on December 5, 2014 at the Southbridge Hotel & Conference Center in Southbridge, MA. 8:15am – 9:00am SBIRT Checkup: Where Are We? Brief Interventions Using the Spirit of Motivational Interviewing: These sessions focused on developing and practicing the skills needed to have an effective conversation with patients about their unhealthy substance use. Administrative Focus on SBIRT Integration: This session was be led by administrators working on integration in clinical settings. The focus was on developing strategies to implement a change at an organizational level. Addressing Challenges in Brief Intervention Encounters:This session was for direct care providers that may have some experience addressing unhealthy substance use. The focus was on approaches to effectively work with patients to minimize challenges and maximize motivation to change behaviors. Models of Integrated Care in Practice: This session was a panel of practitioners who have implemented SBIRT in clinical practice. They gave examples of how patients encounter SBIRT within their system and how all components of the system work together. This gave participants an opportunity to explore models that could potentially be implemented in their own practice. Focus on RT (Referral to Treatment): This session focused on the referral to substance abuse treatment system from healthcare settings. Although a small percentage of patients need a referral from healthcare settings, practitioners often encounter challenges when a referral is needed. Managing SBIRT Implementation: This session focused on some of the administrative aspects of integrating SBIRT into healthcare. Topics included engagement of leadership, systems change strategies, employing quality assurance processes, and planning for sustainability over time. This session was for Practice Managers, Administrative Leadership, and Quality Assurance Directors. 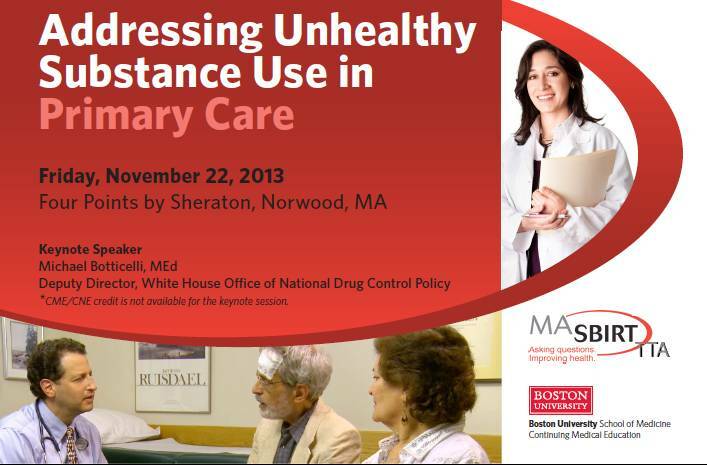 On November 22, 2013, MASBIRT TTA hosted the well received statewide SBIRT conference entitled, 'Addressing Unhealthy Substance Use in Primary Care.' Over 100 participants attended the conference including clinicians, administrators, and service providers. The conferernce provided an opportunity for participants to place SBIRT within the context of the evolving healthcare environment, particularly as part of the advancing behavioral health integration initiatives. Participants also had an opportunity to practice motivational interviewing skills and think about how SBIRT can fit into Behavioral Health integration planning within their organization or individual practice. MI: Am I Doing This Right?